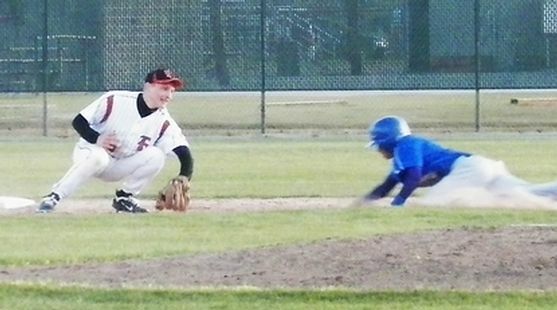 ESCANABA----The Escanaba Eskymos and Stephenson Eagles met for the first time ever in high school baseball Tuesday night, and there was a mixture of good and bad. The good: almost every kid on both rosters got into the game and had some substantial playing time. The bad: there were 12 errors and 13 walks combined between the teams in the contest. In the end, the Eskymos scored 11 runs in the final three innings to post a 14-4 win over the Eagles at Al Ness Field. The game was called in the bottom of the sixth inning on the mercy rule. Eskymo Manager Kirk Schwalbach decided to start his freshmen and sophomores (along with junior Tim Lueneburg), knowing that tough games with Negaunee, Saginaw Heritage, and Mt. Pleasant are coming at the end of this week. Eskymo freshman Jake Rodman pitches. But when the bottom of the fourth inning rolled around, and Escanaba was trailing, 4-3, Schwalbach brought in the "normal" starters. "By the fourth inning, I thought, well, it was time to get the guys in and take care of business, so to speak," Schwalbach said. "I thought the freshmen played well. Jake (Rodman) hasn't pitched a lot, and Tyler (Skufca) was on the mound for the first time for us. But, by the fourth inning, it was time to get the 'W'." The upperclassmen didn't exactly light it up at the plate when they were brought in, either, but this was a game where nothing was pretty. The Eagles committed eight errors and walked numerous Eskymo batters. That contributed to Escanaba scoring three runs in the fourth to take the lead, five more in the fifth, and then three more runs in the bottom of the sixth inning to end the game on the mercy rule. Stephenson's Ricky Chaney had a strong game at the plate, getting three hits in four at-bats. He drove in two runs with a double in the sec0nd inning that gave the Eagles a 3-2 lead. Chaney also pitched the first four innings, allowing six runs (three earned) on just two base hits and six walks. In the bottom of the fourth inning, the Eskymos took advantage of four Stephenson errors and two walks to score three runs and take a 6-4 lead, ending Chaney's night on the mound. "We felt really good about this game and we came out strong," Chaney said. "We kept it close. 6-4. But then we made some changes in the field, and people started to get a little uneasy, and we started making errrors. Hopefully, by the end of the season, we can turn it around." Escanaba's Cam Beversluis comes into first base on his first inning base hit. Then in the fifth inning, three more Eagles errors helped the Eskymo cause, with freshman Tyler Skufca getting a two-run hit to highlight the inning. Ben Kleiman's two-run single in the sixth inning ended the game on the mercy rule. Kleiman was the only Eskymo to get two hits in the game, as the Eskymos talied eight base hits on the evening and the Eagles managed to get five. On the mound, freshman Jake Rodman pitched the first two innings, allowing three runs (two earned) on three hits. Skufca pitched the next three innings to earn the victory, allowing one run on two hits. Andrew Sedlar tossed the final inning. He walked the first two men he faced, but struck out two and got a pop fly to end the ballgame. For Stephenson (2-5), Chaney took the loss, giving up six runs (three earned) on just two base hits, in four innings of work. Chaney walked six batters to hurt his cause. Matt Hanson tossed the fifth and sixth innings for the Eagles, allowing eight runs on six hits. "We're a young program," Eagles Coach Dan Koller said. "These kids have been playing Legion ball for us for a year, and now we're getting this high school thing rolling. We saw some good things out there. Ricky threw the ball well, but our defense is a work in progress. We had some good at-bats. We really enjoyed coming up here to play." As for the Eskymos (7-4), this was a tune-up game, as the boys host Negaunee on Thursday, and then face Saginaw Heritage and Mt. Pleasant Saturday downstate. "I'm expecting Negaunee to be good," Schwalbach said. "The (Tyler) Jandron kid is a lefty, and he's got that good curveball that breaks down. The boys know that." Thursday's Eskymos-Miners game starts at 5:00. It will be broadcast live on WCHT-AM (600), and on-line at www.rrnsports.com.